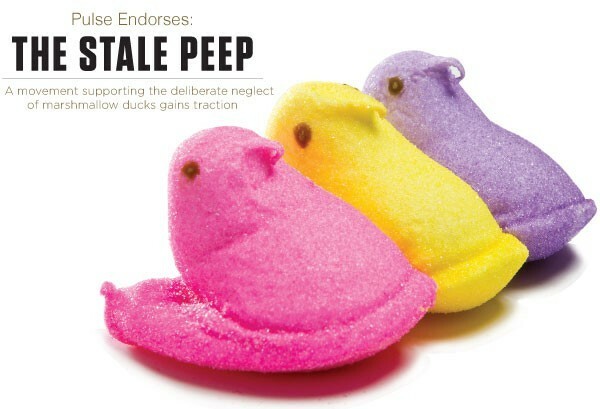 For a fluffy pink or yellow confection in the shape of a duck or a bunny, the humble Peep provokes trenchant reactions. There are those that love them, and those that hate them. But most interesting is a third category of people who like their Peeps slightly stale. Clearly, the stale Peep phenomenon has legs. We decided to investigate. We opened one box of Peeps and allowed them to sit for two weeks; we opened another package two weeks later. In the middle of week three we moved the Peeps to a desk drawer because we found that Zoki, the office dog, will eat Peeps at any stage of freshness. Other than this relocation, the Peeps were unmolested during dry aging. After four weeks, we opened a new box as a control and started testing. The stale Peeps were a hit! Almost all of our tasters bit into their first stale Peep with apprehension, but after chomping through the crusty sugar and into the firmed marshmallow beneath, the predominating opinion was that stale Peeps are better than fresh ones. Un-aged Peeps, we found, are extremely yielding and are sweet beyond the capacity of adult human beings to enjoy. Stale Peeps, by contrast, are still very sweet, but because they settle while aging, the sugars are more slowly released during chewing. While we liked stale Peeps, we do plan to keep them in the category of “sometimes foods” even though the company that makes Peeps is battling to break their product out of its Easter-only pigeonhole. But, this Easter, when we see a pack o’ Peeps on the shelf, we just might bring the little guys home. They’ll be delicious while watching the fireworks on the 4th of July.